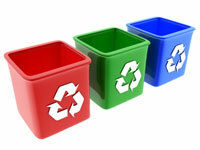 Paper Recycling Coalition » Why Recycle Paper? Recycling recovered paper into products like 100% recycled paperboard and containerboard creates significant environmental and economic benefits for our nation. Environmental Benefits of Paper Recycling Rigorous scientific research has demonstrated that manufacturing paper with recycled content is good for the environment. Producing recycled paper requires less energy than producing paper from trees. By recycling paper, we prevent it from being landfilled where it degrades, producing methane, a greenhouse gas. According to the U.S. EPA, landfills are the single largest U.S. source of methane emissions to the atmosphere and degrading paper 24 times as potent as carbon dioxide is a primary cause. Manufacturing with recovered paperboard cuts down on air pollutants such as nitrogen oxides that contribute to smog and particulate emissions that cause respiratory problems. Producing recycled paperboard and containerboard also requires less water and energy. Members of the Paper Recycling Coalition use approximately 7.2 million tons of recovered paper annually. Economic Benefits of Paper Recycling The recycled paper industry is a major contributor to the U.S. economy. During the 1990s alone, U.S. papermakers invested an estimated $10 billion in new recycling capacity. Recycled paper, paperboard, and deinked market pulp mills employ nearly 140,000 people directly and influence another 615,000 jobs, for a total of nearly 755,000 jobs nationwide. The annual payroll of recycled paper, paperboard, and deinked market pulp mills is $6.9 billion. Through taxes and other receipts, recycled paper, paperboard, and deinked market pulp mills contribute $9.6 billion to federal, state, and local government revenues. Members of the Paper Recycling Coalition have approximately 500 mills in almost 300 different cities, spread throughout 42 states.